Whenever I watch a clip for the upcoming Guardians of the Galaxy 2 movie, Dave Bautisa literally steals the show. His dry humor. His unintentional sarcasm and wit. His cocky knowledge of just about everything- even though he might not always get the situation 100% accurate- is AMAZING. I literally crack up! My kind of comedy. While Guardians of the Galaxy 2 is all action and lots of adventure, the audience can rest assured knowing that there are quite a few laughs packed into this script and movie. And Mr. David Bautisa lands quite a few home runs right out the park! So, it was a PLEASURE to sit down with the big guy and get to learn more about the man behind the powerhouse. 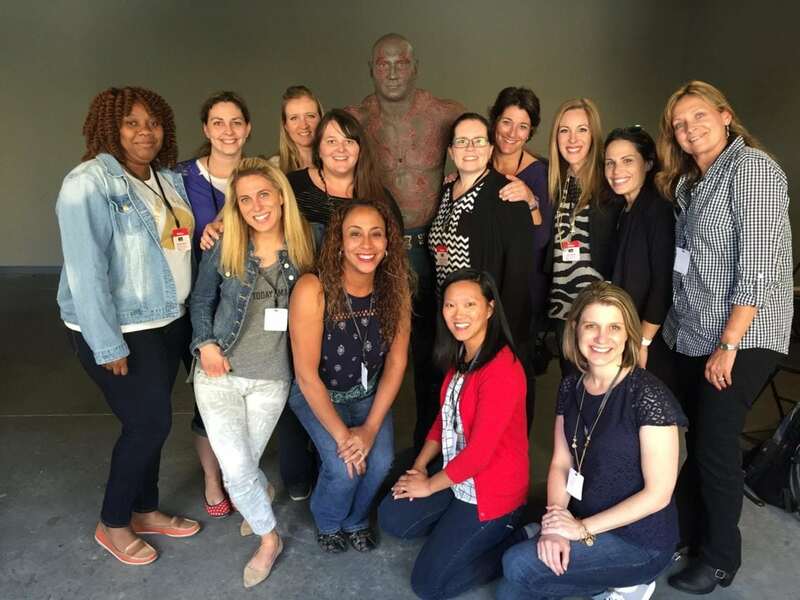 What’s it like to be back with your Guardians of the Galaxy family? It’s awesome. We spend so much time together – not only on the first film but also like on the press tour. We spent a lot of time together. So, we all got to be really close. Especially when we were in London because we really only had each other to lean on, you know? We’re like family. Can you tell us a little bit about your makeup process? It’s awesome, because during the first film, if we got it done in four hours, it was great. I mean, everybody was celebrating. This one is like an hour and a half at the most. It’s because it’s a whole new system they’re using. It’s so funny…. they’d attack me with these — they used to just dab on the paint and that’s how they started the process. Now they attack me with paint rollers. There’s like five guys rolling paint. The tattoos were actually sheets of latex on the first movie. Now, they’re just transferred. So, they are all individual, like they’re glue. They’re moldings of glue so they stick on to me, but also it’s very hard to get off. So at the end of the day I sit in the sauna for about an hour and I sit there and I kind of start to really sweat it off, and they come and peel it off of me. It’s so fast now – it’s not even an issue. Tell us about your relationship with Mantis. I don’t know what’s safe to say without getting in trouble. I don’t want to give anything away, either. 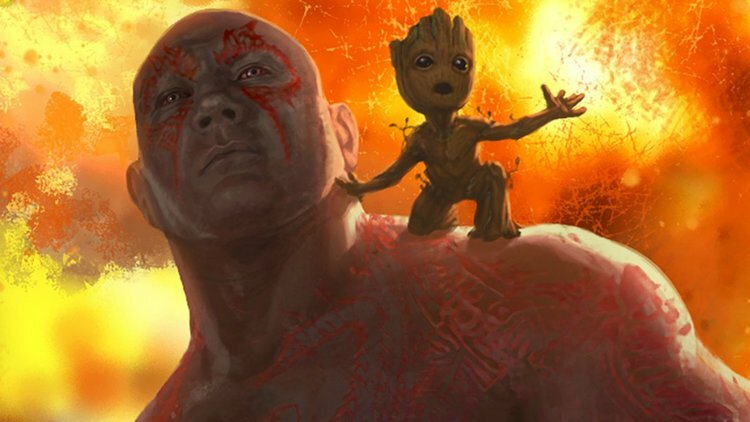 But yeah, I will say Mantis and Drax definitely make a connection. It’s probably not the connection most people are going to expect or that people might be reading into, but definitely a connection. Um, but I think that people have to remember, fans have to remember that the heart of Drax is his heartbreak over his family. I don’t think there’s ever gonna be that next love interest for Drax. I think he had that love interest. She’s gone. That’s what, that what he’s driven by – that heartbreak. That sinking revenge. What do you love about playing this character? You know what I love most about him, I think, is that he is not what people expect. Like when I did the first one, I think people expected Drax to be a certain way, and James went the totally opposite way with him, uh, ‘cause, you know, I think any — if you take a big guy and he looks menacing and he looks terrified, it’s easy to be that guy on screen, you know? You growl a lot, you snarl a lot, you cut people’s heads off and it’s easy. There’s just nothing challenging about it. But to be that guy and look that way, but then to make people laugh, you know? I think is the challenge. And I think that’s the fun part, and that’s what I love about Drax! I think it’s fair to say that there’s a lot more of that in this film. 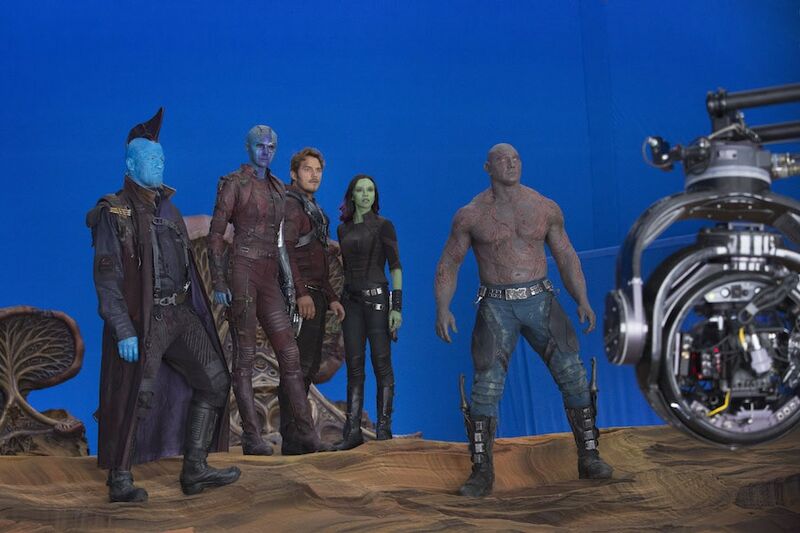 I think Drax just has a bigger role in this film. What’s been the hardest scene to keep a straight face? Oh, there’s been more than a few. There’s been quite a few. A lot of times when I will do my close-up and I have to deliver these lines very straight-faced but they’re funny, funny lines, and Zoe will just start laughing at me off camera or Chris will start laughing. And I have to say stop laughing, ‘cause once I get the giggles, everybody gets the giggles. Um, but there’s a lot of that in this film ‘cause the script is just, it’s just so funny, just so well-written and so funny. What’s one thing you would like to see for your character? I’d like to see my character in The Avengers. You know, this is wishful thinking. How did you get yourself physically prepared for this role? I trained rigorously for this movie and I still do. I can’t train on the days that we work but the days that I’m off, people always say what do you do with your days off? I worked out, I train, you know? Surprise, surprise, I went to the gym, so sometimes twice a day, yeah. Yeah, I’ve been hitting it hard so, ‘cause, you know, I want to deliver. I want Drax to look the part as well so yeah, I really took this more seriously, diving and training, so hopefully, it’ll show. Not any special stunts. You know, I have the same stuntman from the first film, who I met him on that film. It was really hard finding a stunt double for me for a while. And they found him for me on that film and I’ve dragged him across — around the world. He’s been on three other films with me since then. It’s hard to find a big guy who’s like super athletic but also really experienced. As many people know, I’m a professional wrestler and I can do my own stunts. You know, sometimes I don’t want to do my own stunts, you know? I don’t want to! There was a part where they set the character on fire. And I was like stuntman, please! I don’t want to be set on fire. You know, I did my 10 years in WWE. I’ve proved that I’m tough enough. I don’t have anything to prove. Such a great guy!!! Can’t wait to see his scenes in Guardians of the Galaxy 2 and if I am being honest with you – I am HAPPY they aren’t giving him a love interest. Not just yet anyway. That’s just me!!! Guardians of the Galaxy 2 release May 5th — will you be in theatres opening weekend??? *Disney invited me to the set of Guardians of the Galaxy 2. All opinions are my own.